This is a fantastic, rare stereoscopic photograph (an image printed twice and slightly offset, so, when viewed through a stereopticon with special lenses, "tricks" the eye into seeing the two images as one in a 3-D effect) of the bridge that was built across the Los Angeles River on the old Aliso Road, later Macy Street, now César Chavez Avenue, connecting downtown Los Angeles with what would later become the subdivision of Boyle Heights. A cleaned-up detail of the Macy Street/Old Aliso Road covered bridge, built in 1870 across the Los Angeles River by the firm of Perry and Woodworth and which was razed in July 1904. The original is courtesy of the Workman and Temple Family Homestead Museum, City of Industry, California. Click on the image (and the one below) to see them in a larger view in a separate window. Covered wooden bridges are usually associated with the Midwest and East Coast (remember "Bridges of Madison County"? ), though there were a few up in central and northern California, but it is a bit strange to see an example in Los Angeles. Constructed by the firm of Perry and Woodworth in 1870 using public funds, the bridge was the first substantial one to cross the river. Its grand opening attracted a great deal of local and regional attention as the event was hailed as a watershed (sorry, couldn't resist) for the emerging city. Without this lengthy span, it would not have been possible to have had the subsequent eastward expansion of the town, which was then embarking on it first significant growth spurt, which began shortly after the conclusion of the Civil War. In 1873, local power brokers created the subdivision of East Los Angeles, later renamed Lincoln Heights, and this was followed in 1875 by the trio of William H. Workman, Isaias W. Hellman and John Lazzarovich's development of Boyle Heights. For most of its almost thirty-five years life span (oops, there we go again), the bridge served its purposes handsomely, even when floods washed away subsequent bridges built across the river. In 1884 and 1887, for example, major flooding destroyed newer bridges, including a relative new iron one constructed just a few years before on the new Aliso Street, as the old Aliso Road was rerouted as Macy Street. A visit was next made to the honest old structure, which spans the river at its narrowest point (at Macy street) - the only bridge of any sort, railroad or carriage in the city limits which never goes back on its patrons. A rumor was prevalent that it had sagged badly and was dangerous. The TIMES man crossed it twice and found it straight as the geometric shortest line between two points. Such an idea as sagging had never entered its faithful old head. It was very much used yesterday by all sorts of vehicles, as it afforded the only way of getting to the east side with horses. By the mid-1890s, however, it was already seen as outdated, deteriorating and in need of replacement. The economy was in a downturn for much of the decade, so it was not until 1904 that the span was dismantled. In 1926, a concrete bridge was built and still serves its purposes, boosted by a mid-1990s seismic upgrade. The full stereoscopic photograph by Henry T. Payne of the Macy Street/Old Aliso Road covered bridge, ca. 1870s. The penciled-in title at the bottom center reads, "Los Angeles from the East." Courtesy of the Workman and Temple Family Homestead Museum, City of Industry, California. Click on this or the above photo to see them in a larger view in a separate window. 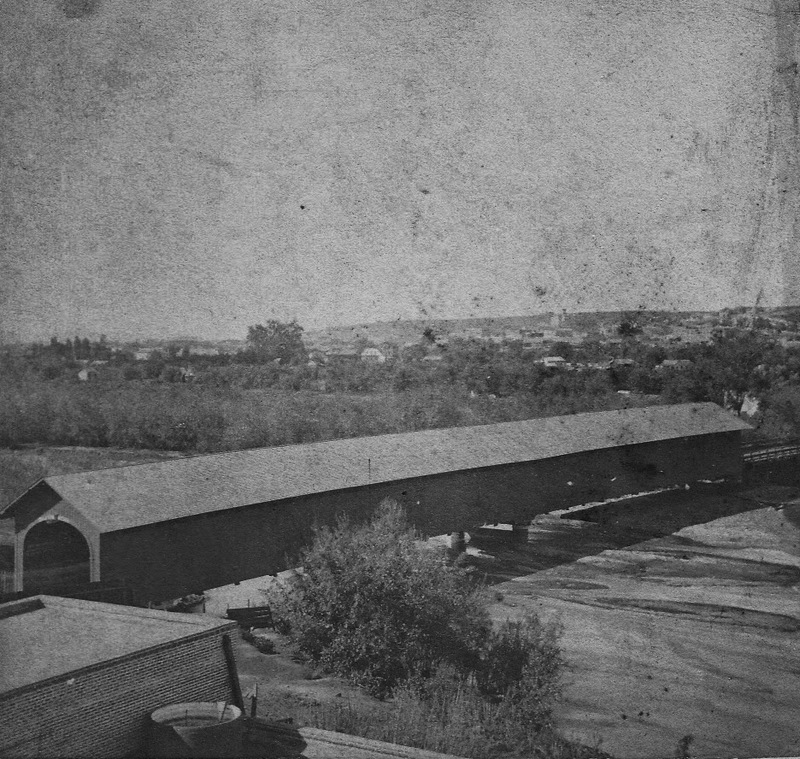 Regarding the lumber firm that built the covered bridge, one of the principals, William H. Perry, went on to take advantage of the span's convenience in linking downtown with the east side to build a home in 1876, designed by noted early Los Angeles architect Ezra F. Kysor, in what became the Mt. Pleasant tract. The house was later moved to the Heritage Square Museum complex, where it is a centerpiece of that facility. Photographer Henry (Harry) T. Payne was born in Plymouth, Illinois in 1844 and practiced his craft in Santa Barbara before moving to Los Angeles to join his parents and brother. Payne took over the photography business of William M. Godfrey and reissued some of Godfrey's important early photos (consequently, a trained eye can tell which photos issued under Payne's name were actually taken by Godfrey), as well as publishing his own views. By the 1880s, Payne, along with his brother, Daniel, and Thomas E. Stanton, created Payne, Stanton and Company, but he soon sold out. By the century's end, Payne was living in San Francisco and working as a journalist. Payne lived a long life, spending his last years in Glendale and died there in the 1930s, well into his eighties. The Macy Street/Old Aliso Road covered bridge was the only of its kind in the region and photographs of it are extremely rare, so this piece of history linking downtown Los Angeles with the area that became Boyle Heights is both interesting and unusual. For more, see Nathan Masters' blog post on local bridges here and another online resource, Bridge Hunter, can be accessed here. Paul, thank you for this wonderful photo and historical information. I grew up 2 blocks from the Macy Street Bridge. William H. Perry the lumber baron had his mansion at 1315 Pleasant Avenue just up the block so it makes perfect sense his company would have built the bridge! Today, the area is littered with glass and automotive dismantling shacks and all that property is now for sale. Perhaps someone with a vision will rebuild this historic area around the Macy Street Bridge. Hello anonymous, thanks for the comment. There'll be an addition of something found in an 1873 newspaper soon, which changes the dating of the bridge's construction. Hopefully, this gets added Monday.